This article is about the second level of Yoshi's Safari. For the location also known as "Mushroomland" in early media, see Mushroom Kingdom. Mushroom Land is the second level of Yoshi's Safari. It is located in the Light Realm of Jewelry Land. It can be accessed once Mario and Yoshi complete Grass Land. Mushroom Land features an autumnal landscape with wide yellow meadows. 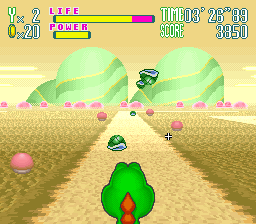 The level is named after the numerous pink mushrooms that are scattered along the wayside and in the background. Also in the background are some large green hills. Common enemies in Mushroom Land include yellow Koopa Para Troopas, Flying Goombas, Nipper Plants, and Lava Bubbles. At one point, Mario and Yoshi encounter a barrage of Green Shells sliding across the path. Mario has to clear the path with his Super Scope before traversing in order to avoid damage. Aside from that there are no obstacles that need to be jumped over, and no mini bosses to fight. Ludwig von Koopa in Mushroom Land. 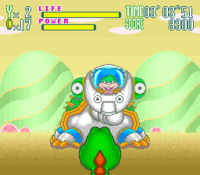 At the end of the Mushroom Land level, the player battles Ludwig von Koopa. The Koopaling fights Mario and Yoshi in a large robot modeled after a turtle with a long neck and spiked shell. The Koopaling sits in the machine's head. He attacks by firing green blasts out of one of the two cannons on the side of the robot's head. The machine's weak point is a large purple bulge on the top of the shell. After taking enough damage, the mech explodes, leaving only its legs on the ground. Then Ludwig, still in the head, drops out of the sky as the robot transforms, growing arms where the cannons were previously. This new robot fires from the arms and mouth. Destroying the arms and then shooting the mouth destroys the robot. Ludwig lands on the ground waving a white flag and the level is completed after Mario receives the gem Ludwig drops. This page was last edited on November 24, 2018, at 10:54.